We are well into Richard, our hapless hero’s adventures in London Below. Chapter 10 ended on a bit of a cliffhanger so I’m keen to hear your thoughts. Below are mine, plus discussion questions and important notes about next week. Also a quick reminder to go back and check your previous posts to see if there are any replies, and feel free to reply to eachother, there have been some great discussions. Today’s featured photo is by @writinglaraferrari whose photo of a cute little rat was accompanied by a tiny little story, make sure you check out her instagram account to read it! Your photos are incredible, choosing a feature image is the hardest part of this read-along. I can’t wait to see your photos for the next challenge, and I’m planning to make a collage of all my favourites (including some which missed out on features that I loved) once we finish reading! We have passed the halfway point! 168 pages down and 150 to go, though I know a few of you were not able to resist and have read further or even finished already. I found this section a little slower, it felt like catching my breath after the hectic first section. A lot happened though, including the Marquis stealing candy from a baby at the end of chapter 6, a visit to The Earl’s Court, Door & Richard gate-crashing Jessica’s exhibition and then drinking Atlantean wine with an angel, and of course de Carabas getting himself into the kind of trouble he may not be able to talk his way out of. One of my favourite things about this novel, and it comes up in some of his other work is they playful way Gaiman takes things we know well and turns them on their head by interpreting them literally. In this section Richard ignores Hunter’s warning to ‘Mind the Gap’ and has to be rescued by her once again. It’s just one variation of those ubiquitous warnings you ignore, like the safety briefing on planes. To me this is an example of Gaiman poking fun at society and the disconnected lives we lead, where we are rarely truly present. Throughout this section Richard demonstrates this attitude, he is meeting amazing people (and things) and a whole other world is being revealed to him, and yet he tells the angel he wants his ‘normal’ life back, the life we saw that he wasn’t very much enjoying when he was in it. The scene where Jessica finally ‘sees’ him, and promptly tries to have him removed from the building was a wonderful representation of the relationship they had where she could never really see him for who he was, only who she wanted him to be. I can’t wait to see what the next section will bring (especially for the Marquis, he’s so entertaining), for those who are falling behind it’s a short section of 60 pages so you should be able to catch up, or if you are speeding ahead I will try to write up the discussion post early, so keep an eye on my instagram throughout the week. 1. This section opens with Richard writing a ‘mental diary’ cataloging his experiences and how he feels about them. Do you keep a diary or journal, and if so do you use it as a way to cope with stressful situations? 2. What was your favourite quote in this section? 3. Which was your favourite thing Gaiman has interpreted literally so far? Photo Challenge: #whereiread – Where do you read Neverwhere? There are dozens of you from all around the world, so get creative, show me (and eachother) your reading corner, cozy bed, fav cafe or park. Share something iconic from your country, region or city or perhaps your fav reading buddy if you have a pet. Be creative! Stealing candy from a baby… I completely missed that! It makes me wonder how much else else has passed me by. This is a story of so many layers and I think that’s why it’s such a great one to reread. As Tamsien says, we saw Richard clinging, desperately, to his old life in this section and longs for everything “to be normal again. Boring again. Wonderful again.” I don’t think he would ever have described his life as wonderful before he fell through the cracks but I suppose a boring life might seem wonderful if you aren’t being hunted by a pair of psychopaths and sleeping in sewers… London below may be magical and fantastical but it’s all a matter of perspective! However, one of my favourite quotes is this: “The surges of anxiety were somehow worse up here in London Above, where he was forced to reconcile these two universes. At least below, he could proceed dreamlike, putting one foot in front of each other like a sleepwalker.” I think this illustrates Richard’s refusal to believe what is actually in front of him but it seems to me that that is exactly how he approached his life in London Above at the start of the book. Maybe it has less to do with the differences between the two universes and more to do with Richard himself? Anyway, sorry for the super long comment. I won’t (for now) go into all my thoughts on the new characters or plot twists but I’m looking forward to hearing everyone else’s views. And thank you Tamsien for featuring my photo and my little story! Hope you all like it. Never be sorry for long comments! That’s the kind of comment I love. I’m pretty sure Corrinna wrote a whole essay in last week’s discussion, the more words the better I say! I love that quote too, I had so much trouble choosing a favourite. That one really punched me in the stomach, I know that feeling, the feeling of particular places making waves of anxiety wash over you. It’s truly awful, and I think when I first read this some 8 or 9 years ago I would not have known that feeling. In fact, reading this book now I am reading it in a completely different way. I am not the teenager I was, enjoying a rollicking urban-fantasy read, I’m an adult who has experienced much of the disconnection, isolation, invisibility and anxiety that Richard is going through, and I feel for him far more than I would have before. First of all, let me say that I loved the little story that accompanied @writinglaraferrari’s photo. So creative!! I don’t even know where to begin with this post. I love how this section starts with Richard “writing” in his journal. He really cracks me up. I don’t have a journal, but I did just buy a “Wreck this Journal” to maybe get myself started and jumpstart my creativity. I continue to love this book. I am swept right along with the story and our poor Richard Mayhew. He is the kind of guy that you feel a little sorry for and the kind you want to befriend at the same time. I think I can see him changing a bit in London below. Maybe being a little more independent and/or a little more brave. I keep conjuring up different images while reading. I think it has an element of “the hobbit” with the adventure below – not quite being prepared, but moving forward anyway. Then I sometimes see the influences that Gaiman mentioned, like Alice in Wonderland; for example when the Marquis was checking the time on the large gold pocket watch I envisioned him with a white rabbit like quality. I thought it was interesting at the beginning of Chapter 6 when the Marquis was teasing Richard, and it says “Richard found that he cared less and less what these people thought of him, however. Except, perhaps, for Door.” Does he care what she thinks because he wants her to be his friend? Or more? Is she the kind of girl he would like to have in his life, strong and confident, yet nice and caring? Seems everything Jessica was not. Later in the section when he is dancing with Door he wonders whether he really wants to kiss her. Does he? (I think so). Not that there has to be a romantic element to this story, I just got a little side tracked with that thought there. And what else do we know about Door? I know she is an “opener” but what else? (age? mortal?) . I get the feeling that everyone from London Below are hundreds of years old (thought I don’t know why I think this). I do agree with Lara that there is so much to this book it would be a good one to re-read. I think I’m missing pieces here and there even though I’m trying to pay full attention. As for whether there is a traitor in the group, I hope that Mr. Croup is just making trouble, but it sure does an a bit of intrigue and I’m keeping my eyes open for more related to that respect. Now off on the quest for the key…. what will happen next?? Thanks Dena! Glad you liked my story. I think I’ll have to extend the feature. Yes! The pocket watch is so White Rabbit, and don’t you think the Earl’s Court had a touch of The Queen of Hearts? Off with his head!! Yes, Lara, You should extend the feature for sure! That would be so fun! And I can definitely see The Queen if Hearts in the Earl’s Court! I just heard that Neverwhere was a TV series. Has anyone heard that? Or seen it? I don’t know when. I wonder if it was good? 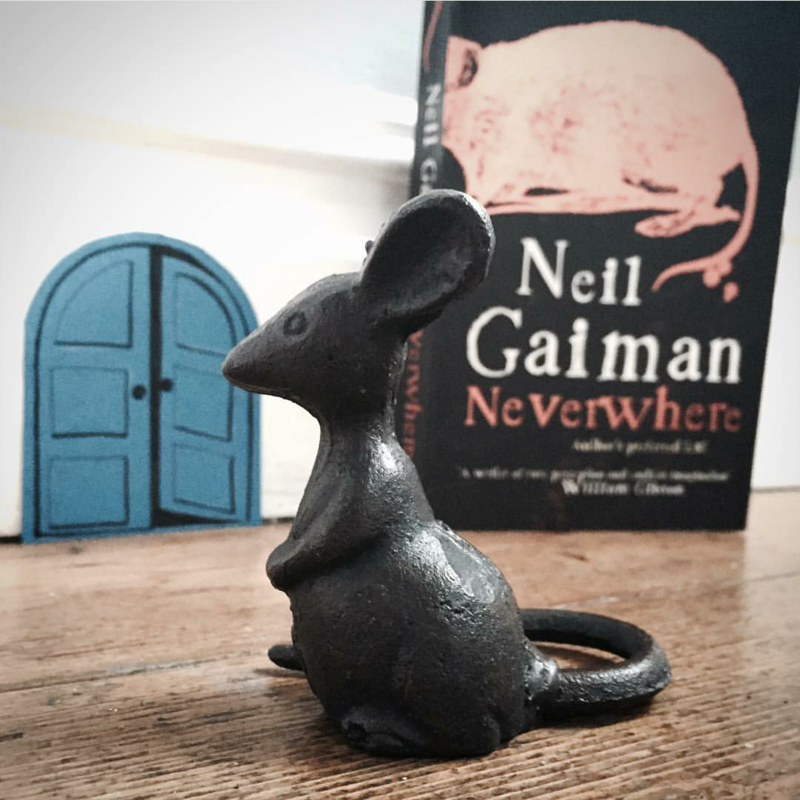 It’s interesting to think though, Neverwhere was actually originally conceived as a TV series and Gaiman wrote it as a novel when they kept changing things! This led to it being published, his first ever novel – though he was moderately famous as a comic book/graphic novel writer before that. And has spawned a very prolific career. I love the things you have picked up with the pocket watch, and feeling like the reluctant journey of Bilbo in the Hobbit, definitely very atmospheric, and I can see Gaiman being inspired by the Hobbit. A Wreck this Journal was a recent purchase of mine too, and I’m looking forward to making notes in it. At a few different times in my life I have kept a journal, and I’ve found it helps in really overwhelming situations. And helps an overactive mind to sleep! And I too can’t wait for the next section! I also have the feeling that the people from London Below are hundreds of years old. Now that I think about it, it’s a similar feeling I had with The Ocean at the End of the Lane. There, one character asks the other, after she’s said she’s 11 years old, “for how long has she been 11 years old,” and this is how I feel with the characters from London Below, they’ve been their age for a really, really long time. Moreover, they do make references every now and then to really old times, and it’s like they were there, and I’d believe they were there. You guys have such great insights into this book!! I love reading everyone’s comments (from these chapters and past chapters!). I completely agree with Lara… I feel like I’m missing bits and pieces of the story. This is my first time reading Neverwhere, and I have a feeling I will be rereading it in the future to pull out even more of Gaiman’s story that I missed the first go around. I think that’s a great way to look at life. If we all just sat around waiting for things to happen, for answers, or for life to change, you’re wasting your current moment. We have so few moments to enjoy, we need to make the most of them (darn you Gaiman, you’re making me think!). I loved being introduced to all of these crazy new characters too, and I’m not quite sure who the supposed traitor is. I thought de Carabas at first since he met up with our villains, but the more I think about it, the more I’m thinking/hoping that’s not the case. Oh that’s such a good quote too! You are all picking the quotes I have tabbed, I will have to post a photo of all my tabs I have been using to keep track of the story as I read so you can see how crazy I have gone with marking things! Glad you are loving all the characters, they are definitely a highlight for me. I love imagining them, how they would dress, and especially what the markets would look like. Such a creative mind! That may be my favorite quote as well. Or top 3, at least. When I read it I went like… damn! As I have read ahead I found it a little hard to summarise my thoughts on who the traitor is without giving away spoilers. I will say, though, that the ending of chapter 9 genuinely surprised me. Of course it was a red herring, but having the marquis de Carabas casually announce himself to Mr Croup and Mr Vandemar, I admit, it got me good. While I admit she is a minor character, it was very comedic seeing Jessica almost redeem herself at the gala. I can’t wait to see what the tv show was like, see if the tone is carried across the same. The concept of the train carriages hosting their own little courts very much reminded me of Alice in Wonderland, and for some reason the film The Imaginarium of Dr Parnassus in regards to the changing setting. Thinking back over the section (reading ahead does mean I’m having to think back unfortunately) the scene is very bizarre and colourful in my minds eye, the feast from the vending machines was a nice touch. Serpentine’s character intrigued me right away, although to be honest she felt a little too villainous – almost cartoonishly so. I just hope she isn’t discarded and does reappear in the narrative. For me, it was very interesting seeing Richard facing both London Below and Above when gate-crashing Jessica’s party with Door, and it helped me to understand a little bit how Richard is taking all of this. One of the things that I wonder the most is Richard’s attitude in this new light of London Below. He’s seeing things he would have never imagined, he’s seeing a whole new world right under where his feet used to walk and, for the most part, or so it seems, he’s pretty much rolling with it. And that’s the thing that puzzles me, how he kind of easily accepts all these new people and places and things. Comparing it to The Ocean at the End of the Lane, the kid in that story rolled with things as well, but he was a kid, and kids believe things easier because they don’t have their world as “sure and well known” as adults do. And then this quote came along: “At least below, he could proceed dreamlike, putting one foot in front of each other like a sleepwalker” so, that’s what he’s doing. He’s in a state of mind where he’s sleep walking. He rolls with what London Below throws at him because he’s taking it as if it were a dream. He wants his life back, so he knows it’s not a dream, but the only way a logical man who’s lived in a known world with known rules all his life can cope with all of this is to just pretend it’s a dream and move on. And yet, he still doesn’t believe in angels, even if one is standing in front of him (and got him drunk). Ah Richard, hapless Richard! Struggling not to believe in things that are right in front of him, and things that are getting him drunk! I think this is actually quite a reasonable response to a crazy situation to roll with it but have inner doubt, it always bothers me when characters that are plunged into fantasy worlds just accept things right off the bat and just the same when they whinge and moan and refuse to participate in the world. In ‘real life’ I’m a bit of a cynic, so I like to think I would ask lots of questions and be curious, but I think to cope I would probably just roll with it like Richard is!! It wasn’t easy, because I’m kind of a quotewhore and I love them all. One last thing. Have we already talked about Richard seeing Door for the first time? Richard even asked Door about that, and she didn’t know either. Any theories? I am thoroughly enjoying the book so far, and I can see how much more fantastic this alternate London would be to people actually living in London. To have that tiny hope that this London Below exists, even though practically it cannot. Listening to that announcement at the station to “Mind the Gap” and having a quiet smile to yourself while subconsciously taking a step (or two) back. And like Tiss has mentioned, I have also been very curious as to how Richard was able to see her, and am glad this was spoken about by the character himself. My theory is that Richard has some connection to London Below that he is not aware of; maybe someone in the family so it was always in his blood, lying dormant till he sees Door? Also, he always acknowledged the homeless guy outside his building who is also more from London Below than Above. So that’s something to think about too. I think there are people exclusively from London Below and those exclusively from London Above, and then there’s people who manage two wander about both worlds. The homeless guy, if I remember correctly, said the rat-speaking people have been nice to him, but still he’s out there, in London Above. I know some people from Below hang out Above and others don’t notice, but this guy didn’t sound like he was part of the Below crew. As for the old lady from the prologue, she’s either one of those who know both worlds, or is a purely London Below person, or a very, very receptive London Above woman. But by no meanings a regular old lady. Aah, the umbrella lady! I had forgotten about her. There was no mention of her later though 🙁 All of this is still very mysterious, and this mysteriousness is part of the attraction, isn’t it? All the speculation and guesswork and hypothesising. Gaiman’s left plenty of room for the readers to make up their own fantasies, and I think I like that too, even though I crave answers from him.